With all the fear and uncertainty floating around our country these days, one thing is very certain---gun sales have gone through the roof! An even more interesting side effect, taking into consideration how tight money is for many Americans, is that so many gun manufacturers are introducing an AR style carbine in .22 LR. WHY? Ammunition is cheap! Compare .22 LR ammo that sells for approximately $.06 each to $1.05 for .223. In addition, a basic .22 rifle retails in the neighborhood of $150.00. There now exists a whole new demographic that has entered the shooting sports arena in big numbers...women and kids! The smaller rim fire cartridges offer little to no recoil, lower sound effects and present a great platform for learning to shoot while having fun doing it. Mold Craft Products of Pompano Beach, Florida, has been hugely successful over the past 40 years in manufacturing high quality, offshore trolling lures, which hold MARLIN MAGAZINE's distinguished title of #I and #2 best marlin lures in the world. For most people, fishing, shooting sports and hunting are shared hobbies. Mold Craft has always been on the cutting edge of new design innovations and recognizes the growing potential of safe recreational target shooting. 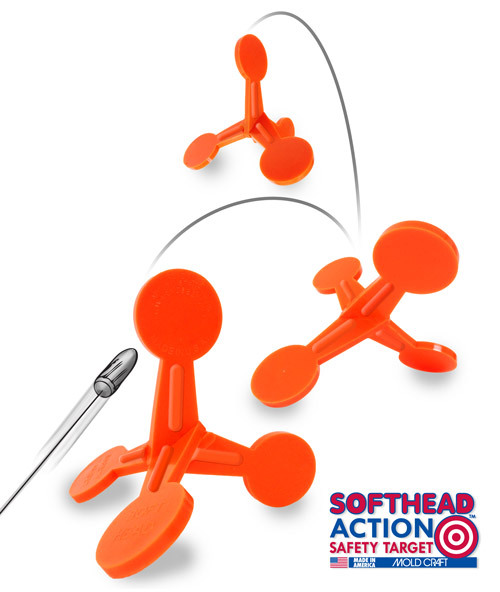 Using the same revolutionary proprietary materials that the famous Softhead trolling lures are made from, the New Softhead Action Safety Target is born. This new and safe shooting system will reward the shooting public with hours of fun and safe target practice. The new SAST has a three-position stance 8" off the ground and, when fired upon, it will flip over to present a new disc for target acquisition. It will also hop and dance with every shot and improve a shooter's skills. The self-healing qualities of Mold Craft's proprietary material will provide long lasting enjoyment. Unlike metal targets, the SAST will allow bullets to pass through, eliminating the risk of a ricochet and possible liability to all concerned. It is imperative for all shooters to follow all Federal, State and local laws and all safety regulations (see list at the end of this flyer). Imagine you want to make sure your gun is on target at 50 yards and you do not have a tree to tack a paper target to. Set the SAST on the dirt ground (never concrete, black top, gravel or any hard surfaces) and pace off your desired range and fire away. Remember this target stands 8" tall with round discs to shoot at. Each time you shoot and hit the round disc, the target will flip over for the next shot without running away. This new target will take multiple heavy ammo loads, although it is doubtful the average shooter will enjoy blasting away all day with a .300 Winchester Magnum or similar considering the cost of ammo and increased felt recoil. The idea of the SAST is to provide safe recreational entertainment while offering a challenging learning experience. Seeing your target react by jumping, dancing or flipping is enjoyable and at the same time teaches the shooter trigger control, sight picture, improvement in accuracy through repetition and, most of all, reinforces safe gun handling. These targets are ideal for law enforcement training, action competition and educating new shooters. The SAST's immediate reaction is a shooter's instant gratification. 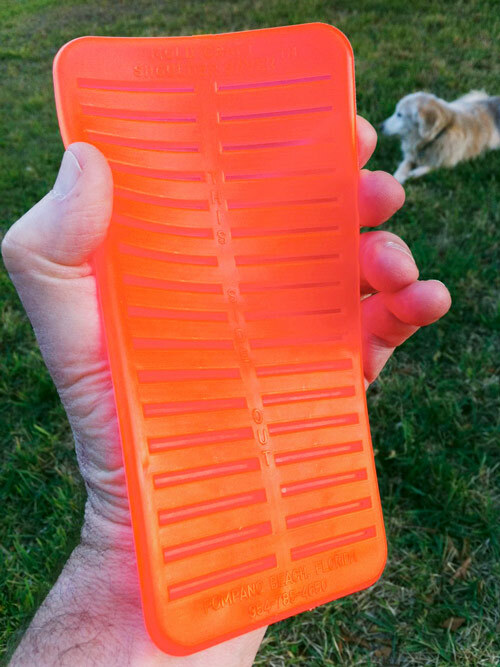 With the abundance of metal targets on the market and in the field a higher risk of injury from ricochet, for both the shooter and bystanders, poses a credible threat. Mold Craft has created a product made of such proprietary properties of resiliency and self-healing qualities that makes it a much safer alternative for the shooting public. The SAST Takes a lickin' and keeps on flippin'!" • Choose soft clean ground to place your SAST target on. Never place on concrete, gravel, rocks, blacktop or any other hard surfaces. • Not recommended for use by anyone under 16 years of age. • Always keep firearms, ammunition and targets out of the reach of children. MOLD CRAFT PRODUCTS, INC. DOES NOT ACCEPT ANY RESPONSIBILITY FOR DAMAGES AND/OR INJURY FROM THE USE OR MISUSE OF THIS PRODUCT. Mold Craft SHOULDER SAVER™, dramatically reduces felt recoil when firing rifles and shotguns. 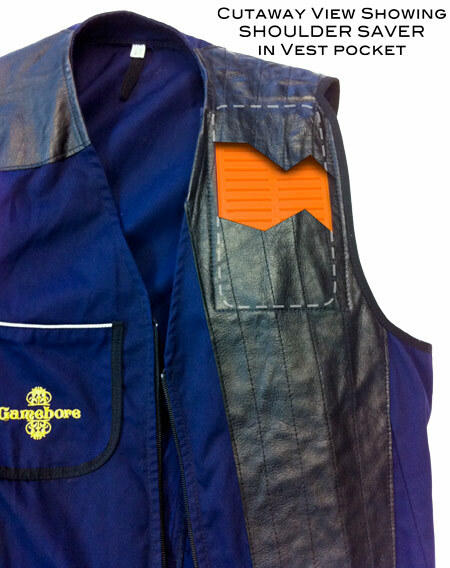 Fits Browning shirts and vests or others with Velcro® provided. From Mold Craft with over 20 years of innovative fishing products responsible for over 80 Big Game Fishing World Records. Horizontal I beams spread the load over a much larger area while providing vertical flexibility and comfort. It is firmer than most pads to distribute the shock over a greater surface. Made from a space age material.